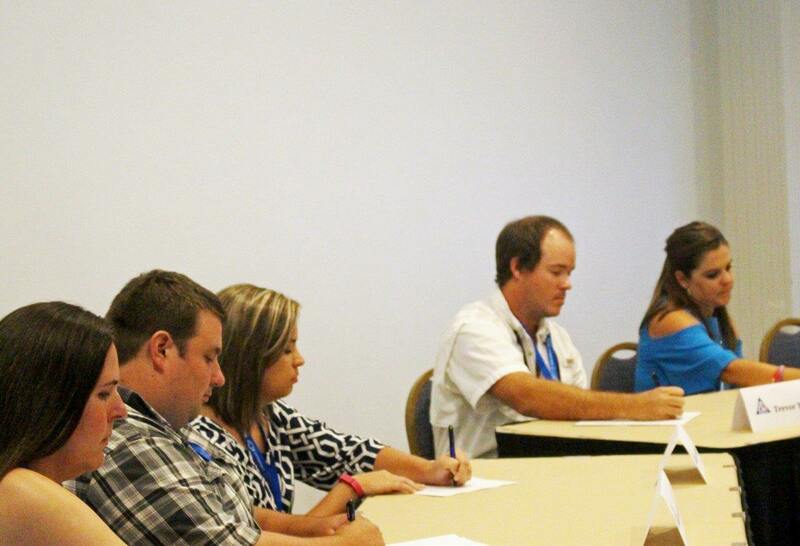 Kiley Larsen of NK Lago Farms, LLC, Kaylee Norris of Highland Precision Agriculture, Trevor Murphy of Murphy Ag Solutions and Scarlett Jackson of Warner University were named the top four finalists for the Florida Farm Bureau’s Discussion Meet competition held at the Young Farmers and Ranchers State Leadership Conference in Naples, July 15-17. The four agriculturists will advance to the final round at the Florida Farm Bureau state annual meeting in Orlando Oct. 26-28. The Discussion Meet contest is designed to simulate a committee meeting where discussion and active participation are expected from each participant. This competition is evaluated on an exchange of ideas and information on a pre-determined topic. The judges look for contestants who offer constructive criticism, cooperation and communication while analyzing problems and developing solutions. The winner of the state competition will receive a $500 cash award, an ATV Polaris four-wheeler courtesy of Southern Farm Bureau Casualty and an expense-paid trip to the 2017 American Farm Bureau Convention in Phoenix Jan. 7-9, where the winner will represent Florida in the national Discussion Meet competition.